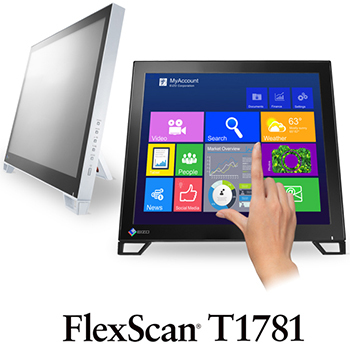 Hakusan, Japan, January 16, 2014 – EIZO Corporation (TSE: 6737) today announced the release of the 17-inch FlexScan T1781 multitouch monitor. The FlexScan T1781 combines 5-point multitouch capability with superb image quality and an ergonomic and durable design for offices and public access areas such as libraries. Furthermore, it complies with IEC60601-1 standard for medical equipment, making it suitable for hospitals and clinics. The FlexScan T1781 features a flat surface from edge-to-edge that enables seamless touch operation. The 17-inch screen uses projective capacitive technology which provides excellent finger touch response when tapping, scrolling, dragging, pinching, spinning, etc. The multitouch interface is supported by Windows 8.1, 8 and 7. The monitor has a native resolution of 1280 x 1024 and an IPS panel with almost no color shift or change in contrast when viewed from different angles. The wide 178° horizontal and vertical viewing angles ensure two people can comfortably view the screen. With a maximum brightness of 350 cd/m2, the screen remains visible when used in a brightly lit environment. A non-glare screen reduces eye fatigue by dissipating reflective light. A “Paper” mode preset simulates the look of printed paper to help prevent eyestrain when reading documents and eBooks by adjusting the brightness of the monitor and reducing blue light. The FlexScan T1781 also prevents eye fatigue by regulating backlight brightness to reduce screen flicker that is perceivable by some users. An overdrive circuit reduces gray-to-gray response time to only 6 ms when viewing video which ensures a clean and sharp image. The FlexScan T1781’s reclining stand makes placement and positioning simple and comfortable for office work and multitouch applications. The bottom of the bezel rests on the desktop like a notebook PC and tilts back freely from 15° to 70°. This allows the user to touch the monitor comfortably without having to extend his/her arm. EIZO’s ScreenManager Pro for LCD (DDC/CI) utility software for adjusting the screen size, position, color, etc. with the mouse and keyboard.